After 58 years of TLC, this adorable home is ready for a new chapter. 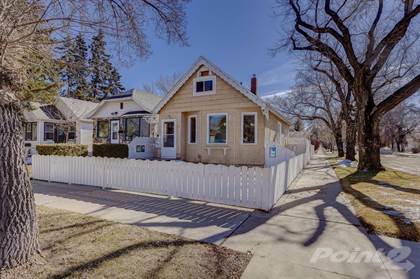 Situated on a corner lot in desirable Caswell Hill, just one block to Ashworth Holmes Park, this 1 ½ storey is picture perfect, complete with the white picket fence. Within the 885 sq. ft., the rooms are well planned and have been updated with laminate flooring through the living and dining rooms, cork flooring in the kitchen, newer windows and newer furnace. The kitchen has solid oak cabinetry with a pantry, tiled backsplash, fridge, gas stove and there is ample room for casual dining. There is one bedroom on the main floor and a four piece bath. Upstairs is the spacious master bedroom with unique wood plank walls and sloped ceilings, built in drawers and a separate closet room with lots of storage space. Additional space in the unheated back porch is ideal for extra storage or for summer enjoyment. Off street parking is not an issue with the double detached garage with side street access. Landscaped front and back with added touches of quaint window flower boxes and exterior trim give this special home extra charm. Hi, I'd like to find out more information about 621 31st STREET W. Thanks so much!